A picture, they say, is worth a thousand words. 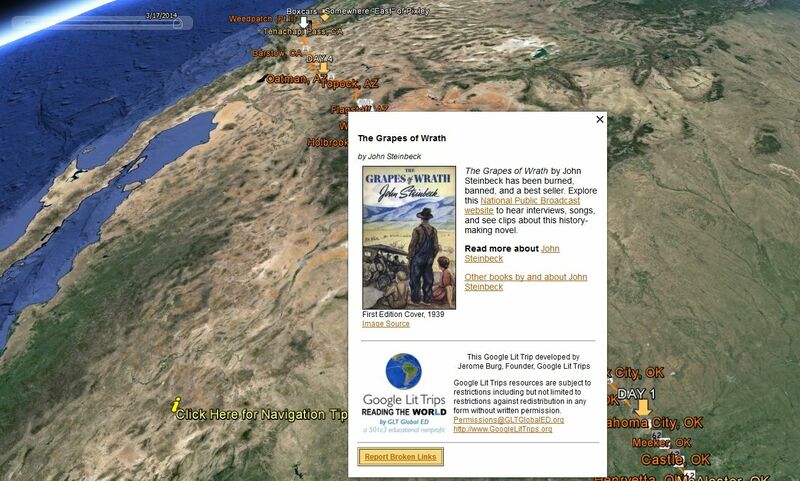 As lovers of a great read, we might not necessarily subscribe to that sentiment, but as well as the more obvious related subjects such as Geography, Geology, Meteorology, Environment etc, Google Earth can be used to provide dynamic and interactive illustration for many other seemingly unrelated subjects, such a History and Literature. Subjects that involve a journey are particularly well-suited to the use of GE as a tool for illustration. The attached file shows a journey in literature - in this case, the Joads' migration from Oklahoma to California. It shows not only the scale of their journey, but how, by the use of text, images and links in the placemarks one can add supplementary information at each stage along the road. Placemark text can also be used to encourage your students to draw conclusions and to test their understanding in an interesting and relatively painless manner. This particular example was taken - fairly much at random - from Jerome Burg's excellent website Google Lit Trips. The files, if not directly compatible to your teaching style or needs, can easily be modified to incorporate your own teaching material, or used merely as a source from which to draw inspiration for your own creativity. I should say at this point that the Google Earth Community have no affiliation with Mr Burg, other than as admirers of his work and his ethos in providing these outstanding aids to inspiration and understanding for free.